Sigh...he's done. After my interaction at the Loggerhead Marinelife Center, with their turtle patients, and late nights this week striving to capture the essence of these beautiful creatures, I found myself on an amazing journey into the surreal in the wee hours of this night, and early this morning. 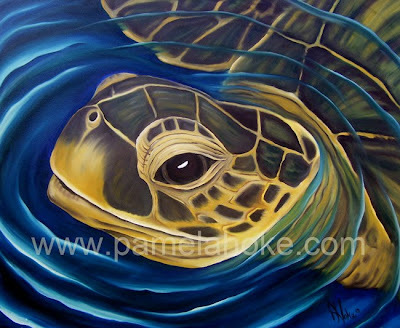 All of the turtles captivated me, and the souls found their way into my heart. However, it was Neal...in his calm, curious demeanor, who popped right up with a smile and seemed to look right into my very soul. It's like he was saying..."hi, what are doing, you seem to show interest in me." It was a connection I will never forget, and knew I had to immortalize in a way I never felt. I was scrambling to brainstorm how to portray all of them, and had to ask my other half, my muse...my Tim. I showed him the photo of that amazing moment, which he also caught on video, then grabbed the large canvas he had just stretched for me...he confirmed it, Neal had to be captured on that canvas. So, after several late nights this week, diving into the depths of all the personalities...the past 2 were the most wild of rides. I joked about it on Facebook this week - a buzz, and no drugs necessary. The first night with Neal was listening to the album Pyromania by Def Leppard...I know strange. The song photograph is what really prompted the moment to just get down to business with communicating my connection with Neal. It is what truly being in your element is all about. The adrenaline rush, the intensity...without the need to eat or sleep, and without any concept of time. When a person is in their element...time stands still. It was 1 a.m. today, when Neal's eyes emerged from the canvas, and the lights began to gleam on his upper lip and snout. "So close..," I thought as I stared at the piece from my patio, "might as well birth this piece now." The next 2 hours flew by as I dove to depths with my paints, and experimented in ways I never had before. So much was pent up over the years from not painting, and so much feeling existed for Neal. The connection was inexplicable. I looked at the part of the photo where his shutes were missing, (he's healing from an infection and his skeleton on his back is bare right now)...yet I saw his will in his eyes. Amidst the adversity, he was so calm and intriuged with life...his will to get well is evident. As the music of Sting and Enya pulled me to an earthly state...I bypass the injury, and see his shutes there just fine...because that is where I want him to be, and where he wants to be. I signed the piece at 3 a.m. - exhausted from being in the zone...and after moving the brushes for the intensity of the water to Crystal Method's "Get Busy Child" (a great "get it done" song...yes, I have extremely eclectic musical tastes - but that's what music is for, just like art...to create a mood - and I firmly believe they feed each other well). My heart was pumping as if I was a musician and just finished an excellent performance, but it was time to just exhale....just let go now, until morning. 8:15 a.m. - had to rise and see the piece in the daylight, knowing there would be tweaks to do, and desparately needed Tim's view. We discussed, and the need for full water emergence feeling had to be there. So I jumped into the pool of blending cool water tones over Neal's warm shell and fin tones - creating the most bizarre of combinations...yet, what I saw was the full circle of rippling of water come to life, Neal's adorable face popping out better than I could have imagined. I have stepped into the world of surrealism in a way I never thought possible - I honestly didn't care how the colors looked together...it was the essense I wanted. The ripples represent our earth. and how turtles like Neal are the ocean's epitome of the circle of life, and we should listen to these wise creatures. Their wisdom far surpasses ours, in my opinion...each one of their wrinkles is well earned, and the turtles that live to maturity have seen more than we could possibly imagine. The species itself has seen the earth millions of years longer than we could even dream. They are suvivors, period. If only they could speak. I plan to strive to create art that gives turtles,and other species a voice somehow. I believe this journey is the beginning of something wonderful - I feel it. What's so beautiful about allowing myself to be into full creative capacity, is the freedom that comes with it...and the fearlessness. I did not fear making a mistake to the canvas...I just went with it - it just felt right. So, the "Neal Painting" is born...exactly how it needed to be. I was going to name the piece "Neal says Hi," however, there's another name waiting....because the piece says so much more. As I fade to rest a bit, and then prepare for next week's journey in florals, I pray that others can see what I saw in Neal, and the bigger picture. Thanks for reading the "Neal painting story" ...I'm too tired to load to my store, but will soon. I'm so peaceful now that I was finally able to communicate Neal to the world. Hope you stay on this journey with me and sign-up to receive my Passionate Pursuit eNewsletter! Wow!!! An amazing story and piece of art. Thanks for sharing. Very moving story. 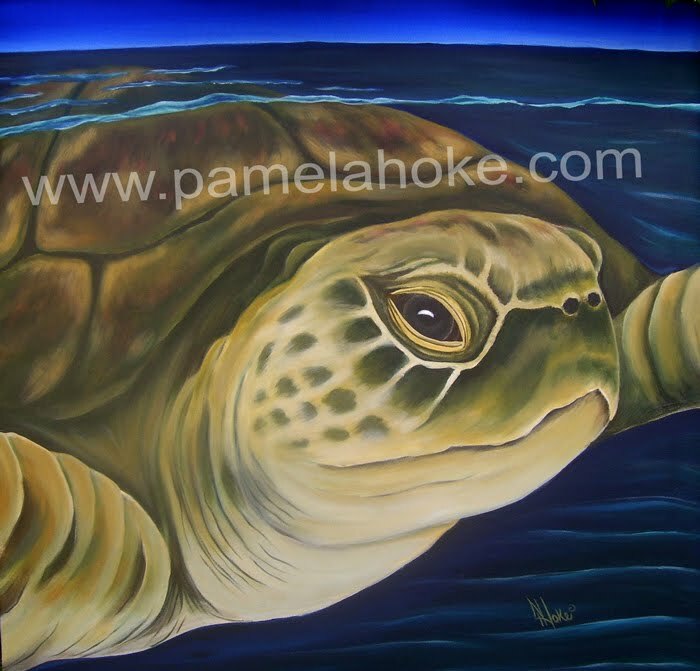 I'm glad that you were able to paint Neal before he passed away and that you gave his portrait to the Marine Life Center.